Email was invalid. Please correct the highlighted fields. This beach hotel in Protaras emphasises an aura of tranquillity – beautiful gardens with running waters and fish ponds lead down to the waterfront and the award winning blue flag Fig Tree Bay. Capo Bay Hotel has earned an enviable reputation with Cyprus holiday makers for its style and attention to detail within the guest accommodation and quality of service. Whichever type of room you choose to stay in, you will appreciate the overall tone of elegance combined with all the modern comforts you would expect from a luxury beach hotel in Protaras. The hotel is an ideal destination for a relaxing holiday in Cyprus. It has a superb choice of facilities, including two outdoor swimming pools, a supervised kids club and a modern spa centre offering aromatherapy, massages, facial and body treatments. Capo Bay Hotel is the perfect choice from a variety of beach hotels in Protaras as it is very close to the picturesque rocky Capo Greco, where the deep turquoise waters are famous amongst scuba divers. Due its position, Capo Bay Hotel is the only hotel in Protaras that combines the beach with a central location. A short stroll will allow you to enjoy the full centre of Protaras with a wide selection of shops and tavernas on your doorstep! Its excellent location, wide choice of daily activities, dining venues and the pleasant surroundings makes Capo Bay Hotel the best choice for you if you are looking for a luxury beach hotel in Protaras. Capo Bay has some of the best hotel service that can be found on the island. Hotel service includes the usual room service, concierge service and doctor on call – we are convinced you will not find so many services in any other Cyprus hotel. While in Cyprus, hotel service is essential to make your stay as pleasurable and relaxing as possible. Our wide range of services have been arranged to anticipate your every need so you will go away from Cyprus knowing you have had the perfect holiday. The hotel room service offers a varied room service menu which is available in the guests rooms. If you need the concierge service to arrange anything for you then all you need to do is ask. In the event of a medical emergency, the hotel doctor is on 24 hour call. The services include one of the best privately owned beauty salons in Cyprus, which can be found in the Reception / Lobby level. 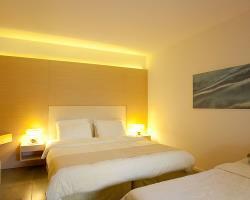 For your convenience the Capo Bay Hotel has one of the most secure covered parking in Cyprus. This service is available daily throughout the summer season except on Sundays and public holidays. Computer working stations with internet access are available at a charge. Free WiFi in the Lobby area of the hotel. Available in all rooms, and outdoor areas at a fee. Capo Bay Hotel welcomes people with disabilities. The hotel is equipped with ramps for easy access to the entrance of the hotel, the surroundings and the beach. Three superior sea view rooms have been especially designed for guests with difficulties. Special parking places are available. Whether yours is just beginning, all grown-up or at any stage in-between, Capo Bay is a wonderful base for your family. We go out of our way to make our youngest guests feel welcome, and our staff is always close at hand to make them feel pampered. Capo Bay is a child friendly hotel as offers several services and amenities for our younger guests. The kids club is open from April to October and is available to guests with children from 4 to 12 years of age. It is fully supervised by qualified personnel. The hotel offers a varied children's menu throughout the day or children's corner in the restaurant buffet during dinner. Baby sitting is available to all guests for children of all ages and takes place in the comfort of the guest bedroom at a charge. Not all guests come to the Capo Bay for relaxing holidays. Many come on business and the business facilities will ensure that it feels like you have the use of your own office. There is a business centre that has a desktop computer with internet access. There is a printer, telephone, photocopying and fax facilities are available at a charge from the Front Desk. The hotel also has conference facilities for your use. These conference facilities are perfect for your business in Cyprus and include one large or two small conference rooms with capacity up to 220 person in theater style and two meeting rooms with a capacity for up to 14 persons in each. Equipment with this facility includes LCD projector, screen, overhead projector, flip charts, wireless microphones, internet access and full technical support. You can be sure that you can run your conference and business in Cyprus with confidence and without the need to bring expensive equipment with you. So if you are looking for the venue of your next annual conference, then Capo Bay is the ideal destination for you. 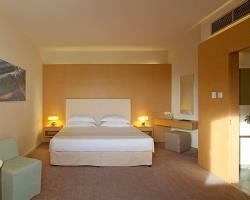 If you are looking for comfortable and luxurious hotel rooms in Cyprus then Capo Bay Hotel is the ideal destination. There are 225 elegantly designed rooms that are fully air conditioned and offer bathrooms with whirlpool or jet, satellite flat screen TV, Wi-Fi internet connection (at a fee), direct dial telephone connection, mini bar, hair dryer, safe deposit box, tea and coffee making facilities and private balcony. The Capo Bay hotel has rooms and suites to suit the needs of the most discerning guests. The hotel is perhaps unrivalled for the marvellous views many of the hotel rooms offer. The hotel rooms offer such luxuries as whirlpool or jet in the bathroom, balconies, views over mountains, the sea, or the lovely gardens surrounding the Capo Bay Hotel. Hotel rooms in Cyprus do not get more luxurious than at Capo Bay Hotel. If you are not sightseeing in Cyprus you can relax in your hotel room quite easily. A hotel room in Cyprus with so many facilities will leave you wanting to come back each year for a holiday. The rooms provide you with Wi-Fi internet access (at a fee) so that you can relax while emailing friends and family about your wonderful holiday. 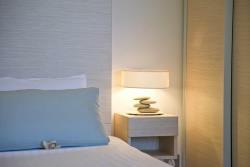 All the Twin Inland View rooms are contemporary designed and illustrate attention to detail and comfort. The inland view rooms overlook the main centre of Protaras, a lively resort during the summer season. 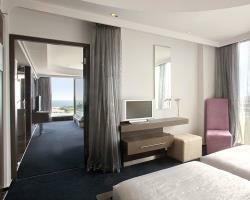 Completely redesigned rooms with new floor, design conscious furniture and easy lighting to provide a relaxed ambience. The Sea View Rooms are contemporary designed, introducing an entirely new interior decor from furniture and floor to lighting in an eye-catching scenery. In the renewed contemporary interior, all the Superior Sea View Rooms welcome you to the overall tone of elegance with every thought given to comfort and detail. The Capo Bay hotel offers four open plan Junior Suites with a unique contemporary design, with uninterrupted views of the blue flag awarded Fig Tree Bay. A contemporary style decorated master bedroom on the upper floor, with sea view, and separate sitting room outdoor heated whirlpool jet for 2 people on ground level facing the garden with terrace. The two rooms are connected with an internal staircase. 46.60 to 56.00 sq. mtrs approximately, including the bathroom areas. The Master bedroom has a bathroom equipped with whirlpool, where as the Ground floor shower with jets. 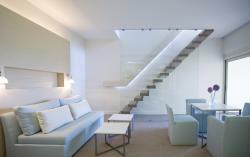 The balcony and terrace of the Duplex Suites have been extended ranging from 13 sq. meters to 17 sq. meters. Fully upgraded rooms, offer accommodation for up to 2 adults and 2 children under 12 years old. Enjoy contemporary design, chic ambience and warm hospitality to match. The Rooms are Inland View. 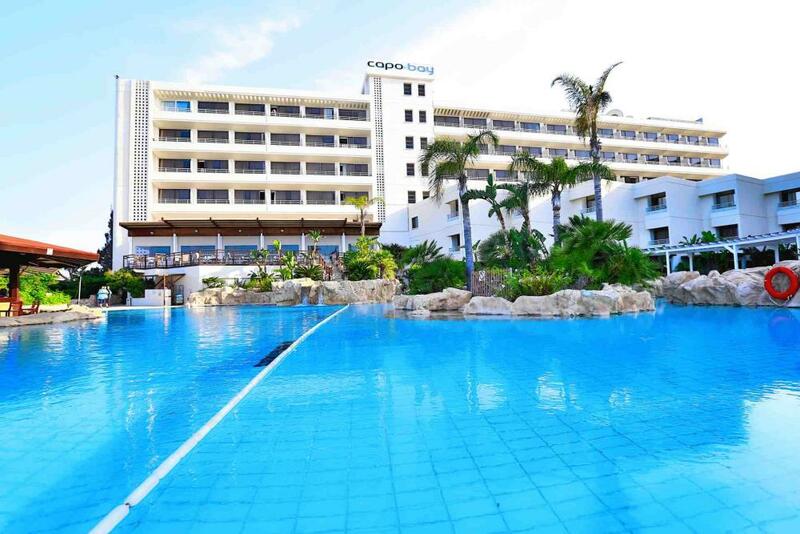 The Capo Bay hotel offers one Executive Sea View Suite with an open plan master bedroom, offering amazing views of the blue flag awarded Fig Tree Bay and connecting to a twin bedded room. The Deluxe Sea View Rooms welcome you to the overall tone of elegance with every thought given to comfort and detail. 23 to 27 sq. mtrs including bathroom area. The room balcony has been enhanced (ranging from 13 sq. meters to 17 sq. meters) which overlooks the main pool and sea. New outdoor furniture on the balcony, will be available for the guests to enjoy great views of Fig Tree Bay Beach. The soft furnishings of the Deluxe Sea View Rooms have been upgraded with a 3 seat sofa, smart TV and espresso coffee machine. In addition to the other standard facilities in the rooms, guests will be able to enjoy their stay in an elegantly designed room. Restaurants in Protaras come no better than the hotel's own Elea restaurant. Its’ pretty terrace means that evening meals can be as romantic as you wish. A sleek, architecturally designed restaurant, that offers an enviable seaside location with astounding views to further enhance the allure of this exceptional Design Hotel. Guests paying for half board are eligible for breakfast and evening meal, lunch is not an option for half board. Bitter lemons... the place to see and be seen! Bitter lemons is the main lobby bar of the hotel. Hip ambience with state of the art lighting technology and artistic visuals that will keep you mesmerized, while sipping your favourite cognac or malt. The heart and soul of any household is mama's kitchen. Dining here will be an experience with a few small surprises. An expression of simple joy, is most probably the best way to describe mama's. Open for lunch or dinner. At lunch time, mama's offers a pool side menu offering snacks and light meals. A Day spa & Lifestyle bar, surrounded by beautiful ponds with Koi fish; this venue is a harmonic space for relaxation. Contemporary healthy eating with exotic reference to an Asian/Med fusion of flavours. Strong bastronomy featuring a water bar, a vodka bar, with rare labels and signature cocktails. A harmonic space for you to relax... be healthy... be pampered, while in the evening it transforms into a hip place! Consist of buffet breakfast and one meal. This can either be lunch or a dinner. Guests may choose from one to three restaurants for lunch or dinner, weather permitting. These restaurants may feature their regular menus, or special theme nights according to seasonality. The restaurants will work on a prior reservation basis. The Dine Around Concept offers a 3 course meal which includes: a choice of one starter, a choice of one main dish and a choice of one dessert. When ordering from the various menus, items marked with an asterisk will be subject to a supplement (extra charge payable at the hotel). a. Elea - breakfast Restaurant - will be used for lunch or dinner when necessary. b. Mama's - outdoor Restaurant - international menu - open for lunch (international menu) and evening meal (Cypriot menu) (weather permitting). c. Koi - a la carte Restaurant - fusion of Asian/Mediterranean - open for lunch and evening meal (weather permitting). d. Capo Cuccina - new speciality restaurant - open for dinner (weather permitting). Guests booking the "pay BB get HB" special offer are not entitled to the Dine Around Meal Option. The Free Half Board special offer is valid for Breakfast and Buffet Dinner at the Elea Restaurant only. The words Cyprus and leisure run hand in hand and the Capo Bay Hotel insures that you can enjoy all that Cyprus has to offer. Try some of the amazing water sports. You can try diving and swimming close to the hotel. Or for a much more exciting Cyprus leisure activity try scuba diving in the beautiful waters near the national park Capo Greco. There are historical and religious sights’ such as Prophet Elias Church. Or there’s the naturally beautiful Capo Greco where you can go walking or cycling through the beautiful nature. If you are feeling energetic, why not try out the gym or the two swimming pools to leave you ready for the night in one of Capo Bay’s many restaurants and bars. Another Cyprus leisure activity you might not have considered is tennis. Within the hotel there are various entertainment acts that are held in the evenings. So sit back and relax. Whatever takes your fancy there is enough variety for you at Capo Bay to meet you your every Cyprus leisure requirement. 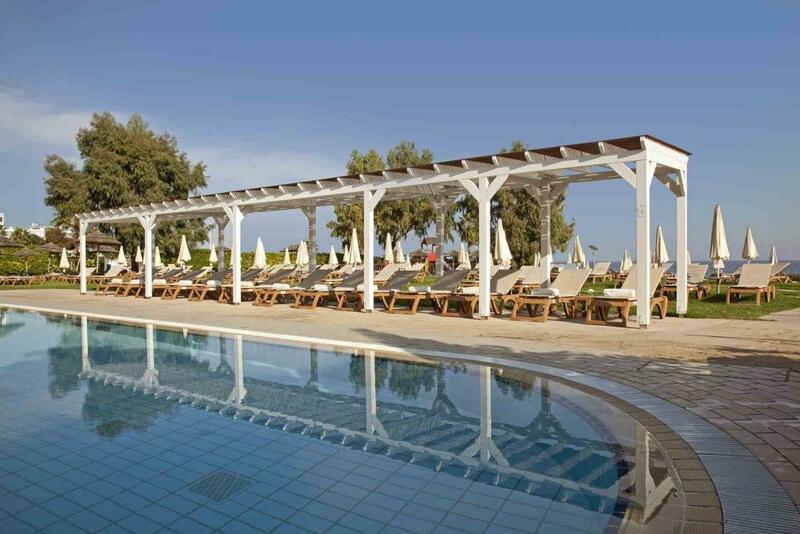 A holiday to Cyprus would not be complete without the opportunity to relax beside the pool with a drink. 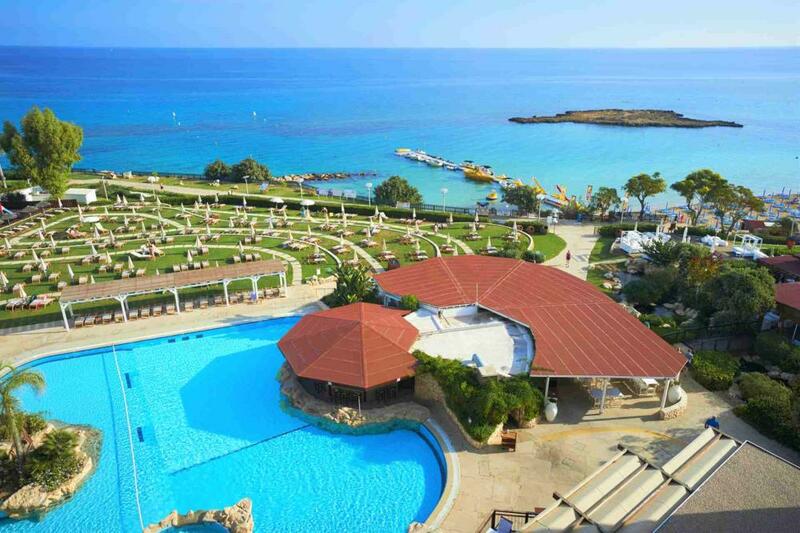 The Capo Bay hotel has some of the best swimming pools in Cyprus which have stunning views of the sea. There are two open air swimming pools with fresh water. One is a free shaped pool with Jacuzzi and there is also a smaller pool for children and one pool that can be used by adult guests only, which is heated during April and for this month only it can be used by children. For the month of April and October, the indoor pool which is part of the adult oneiro spa area, can also be used by children who are accompanied by adults, during the hours 10:00 to 12:00 only. This is a smaller pool and the number of persons using the pool at any one time are controlled. The spa management reserve the right to turn away any children that do not adhere to the rules and regulations of the oneiro spa indoor pool. To help you enjoy the pools fully there are pool towels, sunbeds and sun shades available on the premises for your use. Guests have their own sunbed reserved in the pool area for the duration of their stay, so you never need worry about finding a sunbed. Because there is more than one swimming pool you can rest assured that there will always be plenty of space to swim or just enjoy the water. Another leisure activity you can indulge in while on your holiday is the gym. The Capo Bay hotel has a fully equipped modern gym based within the SPA centre. The fully modern equipped gym will ensure all your fitness requirements are met whilst on holiday. Because of its location in the SPA centre you can follow a rigorous training session with a massage to help you cool down! So by coming to Capo Bay you don’t have to worry about locating a gym in Cyprus to keep up with your fitness regime there is one of the best for you to use at your leisure. Not only does the Capo Bay have the latest equipment but also instructors on hand to give you encouragement and to show you how to make best use of the facilities. If you fancy a game of tennis in Cyprus then the Capo Bay has its own court with artificial grass. If a night time game of tennis is preferred, then the court has floodlights ( available for an extra charge ). Tennis in Cyprus is a perfect way to spend some quality leisure time with friends and family. It is also a good way to make new friendships with other guests at the hotel. The floodlit tennis court is well maintained and offers guests the chance to play tennis when they might never have considered a game before. So why not put tennis at Capo Bay on the list of things to do on your holiday. For a lively leisure activity why not try some table tennis in Cyprus? A quick energetic game of table tennis could be the ideal leisure activity for you whilst on holiday. There is one table tennis table for your use, so have a go with a few friends at the fast energetic game. Table tennis is an ideal way to play a sport with all the family and is guaranteed to be enjoyed by all the children. 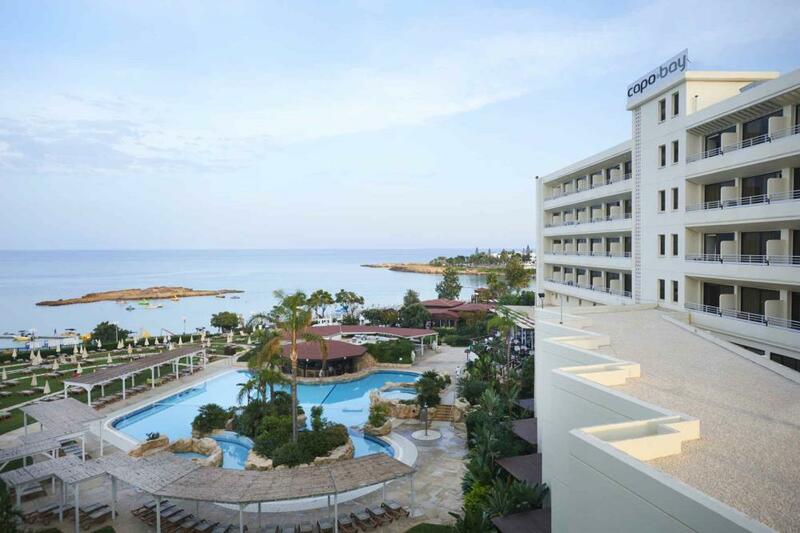 Situated between Ayia Napa and Paralimni lies the rapidly expanding resort of Protaras. The beautiful beach of Fig Tree Bay with it's fabulous golden sands and idyllic coves along with numerous other wonderful beaches in the area provide a great excuse to spend lazy days by the sea. Take advantage of the crystal clear waters with the many water sports on offer including scuba diving. Evenings can be spent enjoying a meal in one of the numerous tavernas or restaurants within the resort or visiting one of the many bars. Protaras also boasts two discos for those seeking a lively night out and only 10kms away is Ayia Napa with it's bustling night life for a wider selection. Facilities in resort are plentiful with a wide selection of shops, however a little further along the coast lies the typically Cypriot village of Paralimni offering a much wider range. Protaras offers spectacular scenery with golden sandy beaches ideal for sun worshippers. It's a relaxed haven that's suitable for both families and couples. DINE AROUND MEAL OPTION VALID - consist of buffet breakfast and one meal. This can either be lunch or a dinner. Guests may choose from one to three restaurants for lunch or dinner, weather permitting. These restaurants may feature their regular menus, or special theme nights according to seasonality. The restaurants will work on a prior reservation basis. Architect and sculptor Joseph Caspari has created an urban space with minimalist fuss-free elegance, in calming shades of grey and black. The "oneiro" Spa Centre - which is considered one of the best of Protaras Spa Hub's - has partnered and exclusively makes use of the leading luxury British spa and skincare brand Elemis . A variety of treatments to hydrate, remineralise, smooth and soften your skin, taking you to a new level of relaxation. The Spa Centre includes a sauna, Jacuzzi, steam bath, hammam, Vichy shower, sanarium, a fully equipped gymnasium and a 15 metre heated indoor lap pool. It is a truly inspirational place for the mind, body, soul and spirit. The Oneiro Spa Centre is for use by persons of 18 years and over. In this modern wellness centre, in a space of 800m², we will enhance your well-being and replenish you through the magic of aromatherapy, massages, facial and body treatments as well as special target treatments. Relax and unwind in a serene environment with soft music while enjoying a wide selection of herbal teas. The Spa centre includes sauna, Jacuzzi, Vichy shower, sanarium steam bath, hammam, heated lap pool with whirlpool and a modern fully equipped gym. All guests don't visit the hotel just for pleasure. A great many come here on business. Hotel's business facilities will ensure that it feels like you have the use of your own office. The hotel provides a business centre that has a desktop computer with internet access. There is a printer, telephone and even photocopies and faxes are available at a charge from the reception Desk. The hotel as has conference facilities for your use. These conference facilities are perfect for your business in Cyprus and include one conference room with capacity up to 220 person in theater style and one meeting room with capacity up to 14 persons. Equipment with this facility includes Lcd projector, screen, overhead projector, flip charts, wireless microphones, internet access and full technical support. Everyone can be sure that can run a conference and business in Cyprus with confidence and without the need to bring expensive equipment with you. Therefore if you are looking for the venue of your next conference, the Capo Bay is the ideal destination for you! 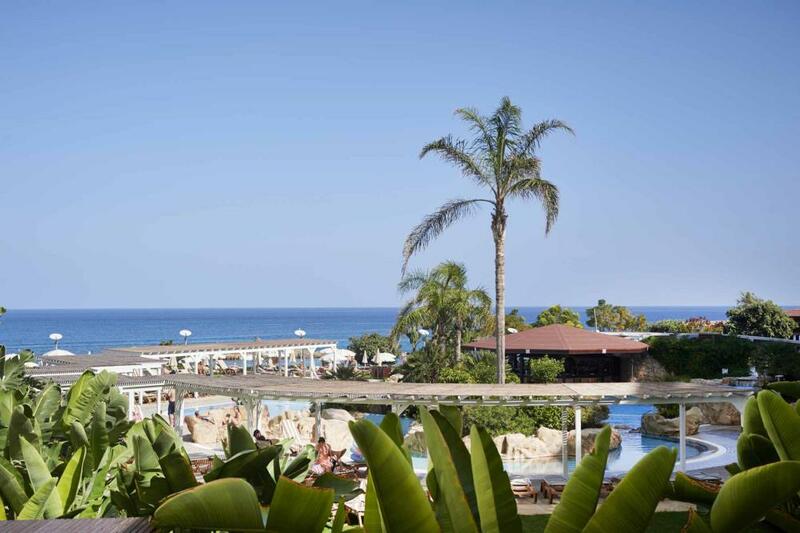 The beautiful resort of Protaras would be the perfect location for your conference in Cyprus. Delegates would attend a conference i state of the art facilities and get the chance to enjoy the sun and the warmth of Cyprus. Delegates would attend a conference in state of the art facilities and get the chance to enjoy the sun and the warmth of Cyprus at the same time - something we are sure will make for a fruitful business trip! If you want to hold a conference in Cyprus then the Capo Bay Hotel has the ideal venues and facilities for you. The hotel consists of the Europa 1 conference room with capacity up to 220 persons i theater style and one meeting room, the Eurоpa 2 with capacity up to 14 persons. Conference rooms are equiped with audiovisual facilities to meet the needs of the smallest to the largest meetings. Internet connection is also available in both conference rooms either through an ethernet cable or wireless. Hotel's audio visual equipment includes Lcd projector, screen, overhead projector, flip charts, wireless microphones and full technical support. The hotel's business centre is located next to the Reception Desk an is equiped with a computer working station, Wi-Fi internet access, printer and telephone direct line. Faxes and photocopies are available in the Reception Desk at a charge. Open daily from 7.00 hours until 23.00 hours. Where a free meal upgrade applies (pay BB get HB free) the meals will be Breakfast & Dinner at the Elea Restaurant.